The Russian Foreign Minsitry believes that former CIA employee Edward Snowden did not cross the Russian border. It is impermissible to accuse Russia practically of a conspiracy and violation of U.S. laws. The Russian Foreign Minsitry believes that former CIA employee Edward Snowden did not cross the Russian border. It is impermissible to accuse Russia practically of a conspiracy and violation of U.S. laws, Russian Foreign Minister Sergei Lavrov told a press conference in Moscow. "We deem absolutely ungrounded and unacceptable the attempts we are witnessing to accuse the Russian side of violation of U.S. laws and almost a conspiracy, which, above all, are accompanied with threats," Lavrov said. "There are no legal grounds whatsoever for this behavior of U.S. officials." Will Snowden impact the U.S.-Russia reset? Russia has nothing to do with "either Mr. Snowden or his relations with U.S. judiciary or his traveling around the world." "He independently chose his route, about which we learned from the media, and he did not cross the Russian border," the Russian Foreign Minister added. U.S. Secretary of State John Kerry said in New Delhi on Monday he would be disappointed to learn that Russia and China had known about Snowden's plans to fly from Hong Kong to Moscow and farther on to Cuba. Snowden flew out from Hong Kong aboard an Aeroflot liner and arrived at Moscow's Sheremetyevo Airport on Sunday. Reports were circulated shortly after, that he applied to Ecuador for political refuge. It was reported he might fly to Cuba after 2 p.m. on Monday but the reports proved wrong. The Aeroflot Moscow-Havana flight departed without the ex-CIA agent. 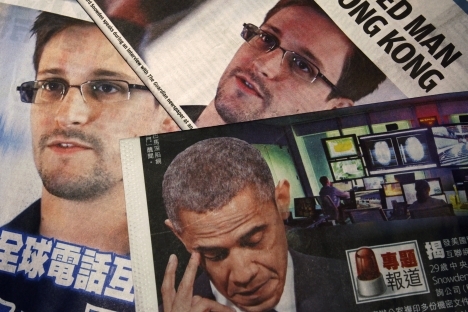 Can granting political refuge to Snowden be Cold War act? At the same time, State Duma International Affairs Committee Chairman Alexei Pushkov says that there is no trustworthy information about the whereabouts of Snowden. "Who says Snowden is in Russia? No one saw him on the flight from Hong Kong or at the airport," he tweeted. "He [Snowden] may be anywhere!" Snowden fled to Hong Kong in May and disclosed information about American special services' surveillance operations on the Internet. The leak suggests that American special services gained access to millions of telephone calls and to the servers of major Internet companies. Snowden may be sentenced to life in prison in the United States. The article is a combined report based on Interfax.